Hi Everybody, welcome to this edition of 5-Minute Finances. My name is Kyle Davis, financial advisor in Orlando, Florida with Integrity Financial Group and today we’re going to talk about a big financial planning problem, maybe the ultimate problem in our personal finances. I’m talking about financing itself. When you cannot afford to pay for something in full, what are your options? Most of us will never pay for a car in cash, so what do we do? We finance them, of course. Would it upset you to know, and listen very carefully, that the interest you are paying on your car purchases throughout your life will likely be worth VASTLY MORE than you will ever accumulate in your lifetime savings and investment accounts? Does that make you scrunch your forehead a little bit? It should. According to the 2012 report published by the Employee Benefit Research Institute (EBRI), on average through savings and investments, workers will have less than $100,000 saved up by the time they reach retirement. Even if a senior were able to get to that $100,000 savings mark… that means if they lived another 20 years after turning 65 – they would have an extra $5,000 a year from their savings, oh and that assumes no inflation, which is ridiculous. In other words, our savings habits are a total joke. Worldwide, among developed countries the US is in the bottom 10 nations for savings rates. This is not new information. This is a simple calculation…and it’s also not the upsetting part. Let me show you what you forgot to calculate, and WHY the interest you are paying on the cars you drive will likely be worth VASTLY MORE than you will ever accumulate in your lifetime savings and investment accounts. 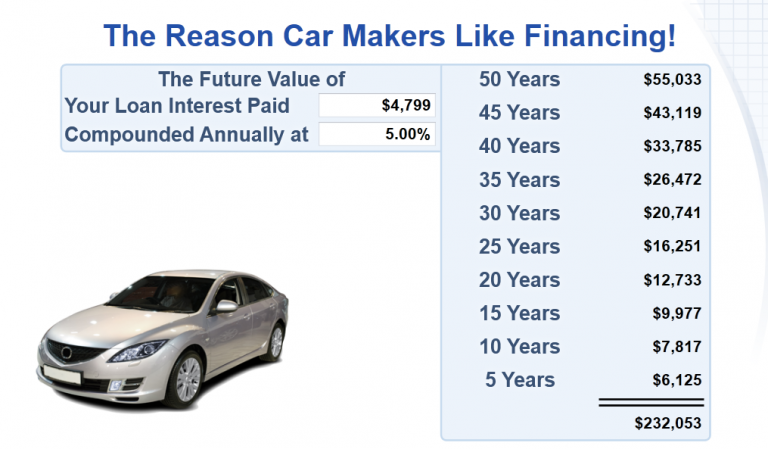 If you take ONLY the interest paid on that car, and you’re buying a car every 5 years for 50 years – at the end of that 50 year period, the interest alone compounded at 5% annually would have been worth $232,053. This is not factoring in ANY principal. JUST INTEREST. Do you really want to give up that kind of compounding potential for a car? How much easier would it be to do your retirement planning with this kind of extra money? Think about this. 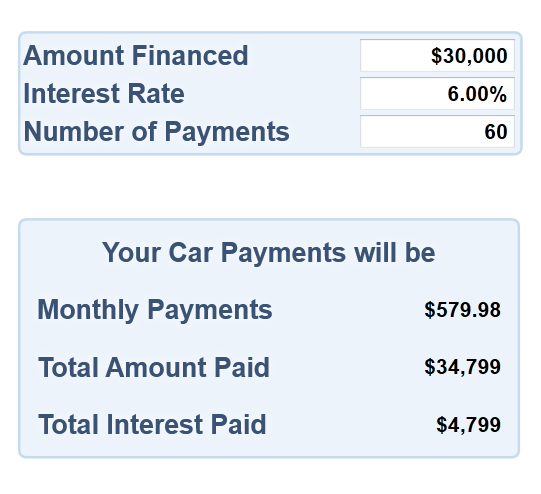 What if you could keep your money in that 5% compounding position and still get the car? What if you continue to compound interest uninterrupted for that entire 50 year period, even though you’ve used the same money to make the car purchase? Suppose there were an account out there that allows you to do that. Suppose this kind of account is older than the IRS tax code and regular people like you and I have had it available to us the entire time? If you want to know more about the types of accounts that can maximize the efficiency of compound interest and still allow you to make your big life purchases, pick up the phone today and call us at 888-688-1414, or visit us online and fill out the contact form.